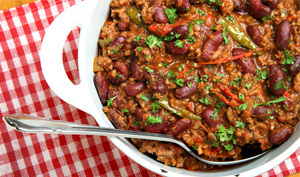 This chili recipe is spicy and cooks enough for at least 6 people. The slow cooking allows all the spices to mix and would pair perfectly with corn bread. Add the chopped onions, peppers, and ground beef to a large pot or Dutch oven over medium heat. Cook until the meat has browned then drain off the excess oil. Mix in the tomato sauce, Rotel, water, and spices. Cook until boiling and add beans. Reduce the heat to a simmer. Cover the pot/Dutch oven and cook for 2-1/2 hours, stirring occasionally.